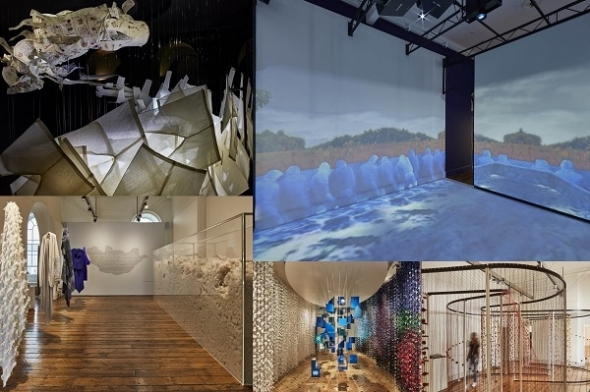 A CHANCE to travel the world through 40 exhibitions, the London Design Biennale, now in its second year, draws together ideas, concepts and experiences from different cultural perspectives and presents them as art and design led installations. For 2018 the theme is ‘Emotional States’, and the works on display explore how design influences our emotions. Each response demonstrates the breadth of creativity and talent that exists globally in the design world. Set over three floors in Somerset House in central London, this isn’t an exhibition you can just pop in to. Expect to spend half a day immersing yourself in the vibrant, interactive displays. The traditional craft of indigo dyeing is the focus of The India Pavilion, where the beauty of this natural pigment used in the fashion and textiles industry is juxtaposed against its darker side: how farming of the product is linked to India’s colonial trade. The installation consists of projections bathed in blue light, showing the intensive nature of indigo farming back in the 1600s alongside footage from just two decades ago depicting more recent working conditions of indigo workers. A positive and uplifting exhibition, Pakistan’s contribution to the biennale captures how traditional handiwork and embroidery skills are lifting women out of poverty and increasing their status in society. The installation ‘Aangan’, consists of cascading cotton garments, some of which are embellished with colourful embroidered motifs. Women make up 50 per cent of the workforce when it comes to cotton manufacturing in Pakistan, the fourth largest producer of the fibre in the world, and it’s female artisans that largely make the fashion and textiles products that are appreciated in the country and wider world. A room filled with floating off cuts of rainbow coloured handwoven fabrics, this installation represented the remarkable tale of Santa Catarina Palopo, an impoverished town on Lake Atitlan which is using art and craft to boost tourism. The town’s 800+ homes are being painted in vibrant patterns inspired by local textiles to attract visitors and businesses. Telling the story of how Mongolian cashmere is on display in this section of the exhibition are huge vats of fluffy goat hair that you can touch. There’s also a video that shows the process of cashmere production alongside hanging garments, set against a wall of positive quotes from locals about why they enjoy working in the textiles industry.